I decided yesterday in the spur of the moment that the workroom should have a fabric sale. Perhaps it was the fact that is was December 1st and it’s now very clear how close the holiday are. Perhaps it was the fact that we were expecting fifty new bolts of fabric but really have no where to put them. Mostly it was just because I think you guys are pretty awesome and you deserve a little pre-holiday treat. To make it even more fun, you get to choose the fabric you’d like to get on sale! Simply purchase 2 metres or more of fabric to receive 10% off your fabric purchase. If you purchase 4 metres or more of fabric, you’ll receive 20% off your fabric purchase. You can even mix and match fat quarters and yardage of different fabrics! 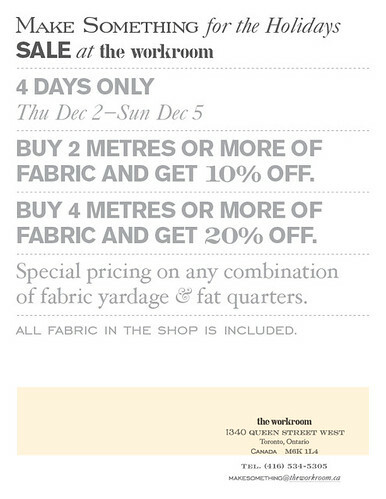 So, 4 Liberty of London fat quarters + 1 metre of nani IRO + 2 metres of Heather Ross’ Far Far Away = 4 metres = 20% off! Whoo! The only catch is that the sale is only 4 days. It starts today and ends on Sunday December 5. AND… tomorrow night is the Sheridan Textile Studio Sale at the workroom. We hosted this sale last year and it was a lot of fun. The students of the Textile program have hand printed fabric yardage, fat quarters, aprons, t-shirts, napkins and created other textile gifts. The proceeds from the sale go towards the graduating class exhibit at the end of the year.